Italy is widely regarded as one of the most beautiful countries, not just in Europe, but in the entire world. Boasting stunning architecture, quaint little villages, incredible historical landmarks, and breathtaking scenery all around, the country is a highly popular tourist destination. 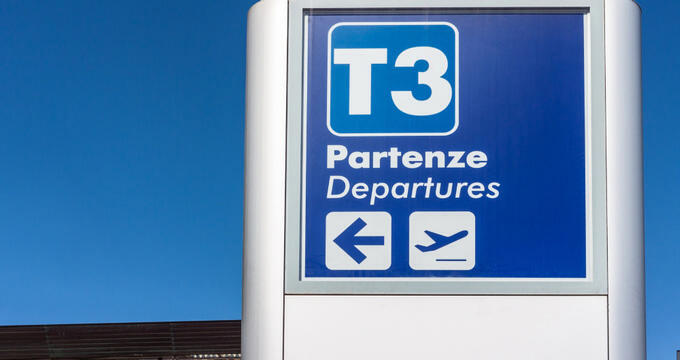 Dozens of different airports can be found all around Italy, with some of the bigger cities boasting numerous international and domestic airports for locals and visitors to use. If you're looking to travel to Italy, here are the top locations and airports for you to focus on. Home to the Colosseum, the Pantheon, and countless other stunning historical monuments, Rome is the capital city of Italy and the most-visited location in the entire country. If you're traveling to Rome, you have the choice of two different international airports: Rome-Fiumicino "Leonardo da Vinci" Airport (FCO) and Rome Ciampino "Giovan Battista Pastine" Airport. The Leonardo da Vinci airport is bigger and busier, but is located further away from the center of the city than Ciampino, which is generally served by smaller and cheaper airlines. Both airports have good transport links with the city but if you want to get to the center of Rome as quickly as possible, Ciampino is the better option. Naples is located in the south of Italy and is well known for its sprawling cityscape and incredible natural surroundings, including Mount Vesuvius. It's one of the biggest cities in the country of Italy and is a very popular tourist spot due to its hot weather and multiple landmarks and attractions. The historic downtown section of Naples is classed as a World Heritage Site by UNESCO and there are various historical sites both in and around the city, with Pompeii not far away. Pizza was also created in this city, which is served by one major airport: Naples-Capodichino "Ugo Niutta" Airport (NAP). This airport is served by many major airlines and serves over eight million passengers annually. Along with Rome, Milan is one of the most visited cities in all of Italy. Regarded as one of the key homes of fashion, rivaling the likes of Paris and London, Milan is home to countless fashion brands and stores, as well as galleries and classy restaurants. It's an elegant, vibrant city and also houses Leonardo da Vinci's famous The Last Supper painting. Milan has two international airports: Milan-Malpensa Airport (MXP) and Milan-Linate "Enrico Forlanini" Airport (LIN). The Malpensa airport is the larger of the two but is located further outside the city than Linate, which is more convenient for travelers who want to get into the city as quickly as possible. Turin is a major Italian city, located in the Piedmont region and home to almost 900,000 people. With a rich culture and history behind it, Torino is a top tourist hotspot in Italy, home of many art galleries and impressive architecture from different periods of history. It's home to some of the country's best universities and isn't far from the borders with France and Switzerland, offering a good base for travelers who want to tour other parts of Europe. Turin has one major airport: Turin-Caselle "Sandro Pertini" Airport (TRN). Located just ten miles outside of the city, this airport serves around 4 million passengers per year. The capital of Italy's Veneto region, Venice is one of the most famous cities in the country and well known as a hugely popular destination with couples due to its romantic themes and beautiful architecture. Venice is unique in that the city is actually made up over 118 little islands, all connected by canals and bridges. Known as the Floating City or City of Water, Venice is an inspiring and beautiful location in many ways, ranked as one of the prettiest places on Earth, with huge numbers of tourists flocking there every single year. Internationally, the city is served by the Venice Marco Polo Airport (VCE). This is one of the busiest airports in all of Italy, offering many connecting flights to other European destinations. The Tuscany region in Italy is known for offering some of the most beautiful landscapes in all of Europe. A largely rural region with many little villages to explore, Tuscany is also home to iconic cities and landmarks like Florence and the Leaning Tower of Pisa. The major airports in this area are Florence-Peretola "Amerigo Vespucci" Airport (FLR) for Florence, Pisa-San Giusto "Galileo Galilei" Airport (PSA) for Pisa), and Marina di Campo "Teseo Tesei" Airport (EBA) for various other cities and areas in Tuscany.